Memorial complex Bahouddin Naqshbandi, Bahauddin Naqshbandi Mausoleum, Sights of Bukhara. 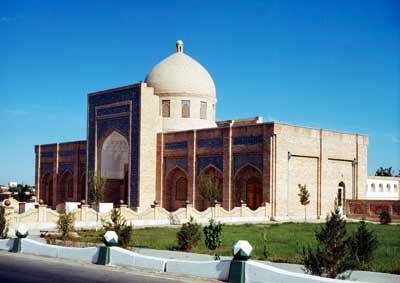 Memorial complex of the great Sufi, asket and saint Sheikh Bahauddin Naqshbandi is near Bukhara. Naqshbandi was born in 1838 in a small village in Bukhara in the family of a weaver, later he had an invaluable influence on the thought formation in Central Asia. In youth he wove patterned silk fabric. Not for nothing he was considered the patron of all craftsmen. According to his studying, if person works manually it gives him the right to independence in the work, actions and thoughts. His famous statement: “Allah is in mind, and hands – in the work”. There is a wishing stone – Sangi Murod inside the wall of the mausoleum. Believers from different countries come here to ask for the fulfillment of wishes. It is believed that Naqshbandi averts disaster. Memorial complex Bahauddin Naqshbandi is rectangular courtyard where the tomb of Saint Sheikh. The modern aivan with wooden columns is decored the central courtyard. The decoration of the ensemble is characterized of XVI century. Dakhma with marble fence was erected by Abdulaziz Khan in 1544, and near was built the great building Khanaka. Later here was formed a vast necropolis – tomb of Bukhara emirs. Decorated mosques Muzaffarkhan and Hakim Kushbegi are struck by its beauty, which formed the courtyard with creek around the mausoleum.